Valentine’s Day comes around every single year and it always seems to draw out the heart-shaped gadgets from the darkest corners of the world. Here’s another one, but at least it’s not pink. Instead it comes in a soft natural shade. These speakers will sweetly play all of your favorite songs. Despite the Valentine’s Day look these will blend in just fine all year round. The power output is 2.5W and the consumption is 3W. The heart is completely made out of wood and then jammed with all of the electronic goodies that’ll make your music play. It’s powered by a USB port and has a 3.5mm audio plug. 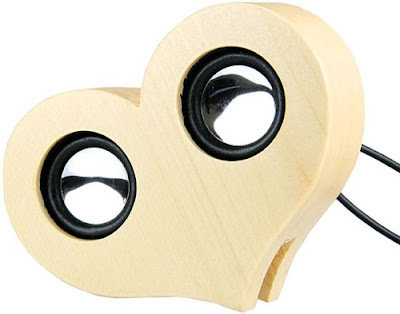 You can purchase the SpeakWood Heart USB Speaker for $22 through Gadget4all. Which makes it a fairly affordable gift to give a loved one.